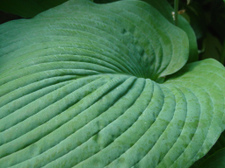 It's a picture-heavy post, for which I do apologize, but the hostas were calling for attention last night. First up, though, is promise. I get positively giddy every year in anticipation of the balloon flowers. They truly do look at lot like this (oh, that's on my list of things to do*), except not so big and all purple. They've been spreading and my love only grows. They are utterly fascinating. Weekend plans? Up in the air. (Heh.) It's possible that I'll be spending many hours in the car, which means that I ought to have a finished pair of Celtic Braid Socks, and possibly that Fixation + Bikini Top (= Fixini). (I can't help it -- it's like an affliction or a disease, a compulsion -- I have to give these things a catchy name!) 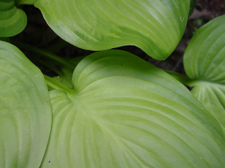 The hold-up is locating free needles of the correct size and type. 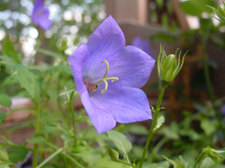 The flowers: Campanula and Coral Bells. The Coral Bells always draw me in at the nursery, second only to hostas! Blue Angel in the back, I'm not sure of the variety in the foreground (it sure is pretty, though! ); Golden Tiara on the right. Guacamole; and that same one I'm not sure of again. 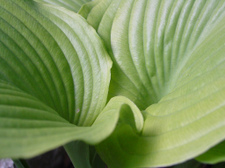 Hosta Library is a fantastic resource. 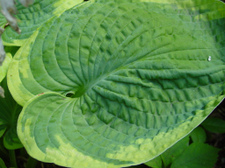 I think I link to them every time I post about hostas! *My book club is reading The Next Thing On My List and we're all coming up with our own (shorter) lists to share at the meeting. Hey Vick! I miss you and I love you and we'll need to do a 3-way soon! Have a great weekend! Your pictures look so cool and inviting. Our flowers have all burned up:-( Enjoy your weekend/knitting! 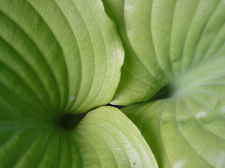 Oh how I love seeing your hostas every summer. Thanks for posting them. 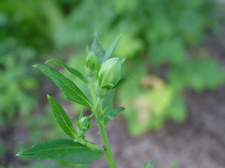 I was not familiar with balloon flowers until they bloomed in the back yard of our first house. They are indeed unique. 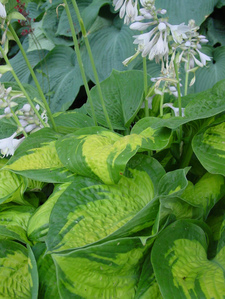 Are all those hostas in your yard? Sweet. 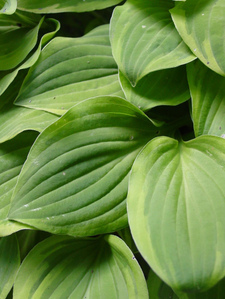 Next week my son's assignment is to dig up an shady area sort of under the deck so I can fill it with hostas and astilbes and (volunteer) violets. Mmmmmm. 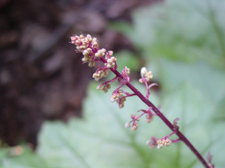 I just love coral bells....such a sweet little flower :-). 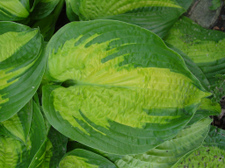 I love that celtic braid pattern too!!! I had to come back and thank you for that book you mentioned. 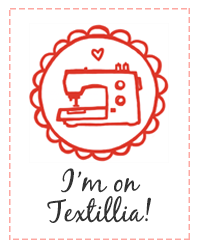 I followed your link to Amazon and discovered she has a blog -- check it out if you haven't already. It's about her progress on her own life list.